Any way to do Advanced Power Search in Amazon product data & description beyond Books? Is there anyway to filter and sort through products with more granular control? Amazon list Movies & TV and Toys & Games as Advanced Search but they do not work. 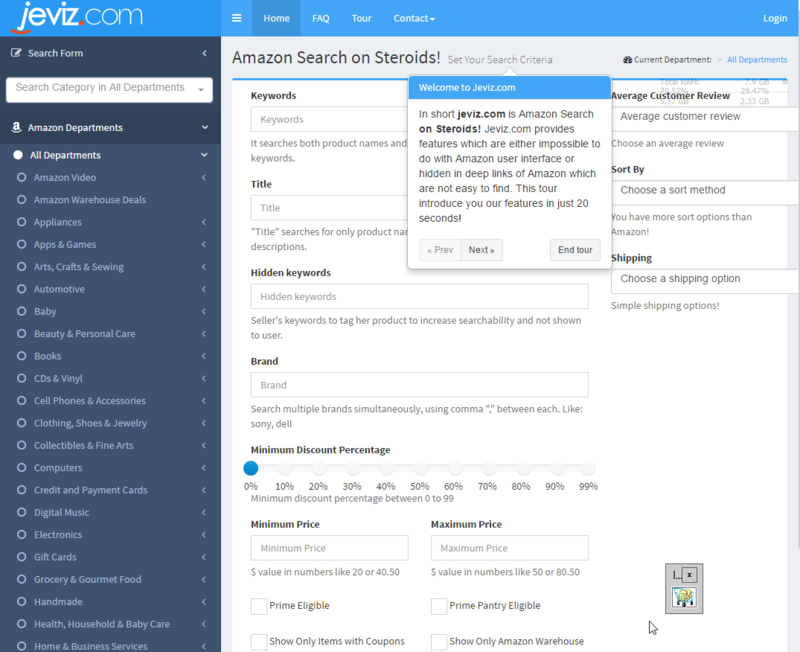 Jeviz.com provides more options for Amazon Departments so that a finer grained search can be performed. There's a self explanatory interactive tour on the site explaining all the features and fields/parameters by which one could search. You can do title search in any department and even Book Search has more features in jeviz. You can get more explanation. Not the answer you're looking for? Browse other questions tagged amazon or ask your own question. Unable to FB Graph Search to find friends from or living in certain place like I used to? How now? Browse only free streaming Amazon Prime videos? How to resurrect one's Amazon Reading List data in Shelfari? How can I get a list of all Amazon Instant movies? Amazon Questions and Answers - does Amazon email owners of the product? Can I block a seller on Amazon? Does Amazon change previewable pages of a book according to some factors? Why are Amazon reviews under the wrong product?